For the last five years we’ve run a raffle at the Birdfair in the UK with a wicked prize of a week’s accommodation at the Quinta, and to date nobody’s ever claimed it and we’ve always given it away to the runner up, but this year is different as Liz Hughes has claimed and so we look forward to welcoming her to the Quinta soon. 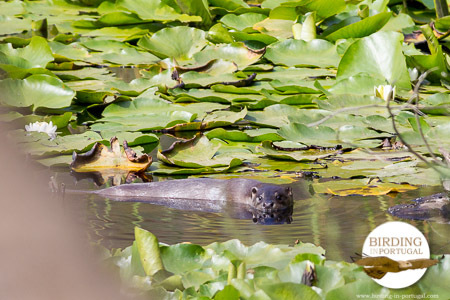 The otter above was photographed today from our Water Rail and Kingfisher Hide down in Santa Clara on a Birding-in-Portugal stake-out and we hope it sticks around till Liz has a chance to see it for herself. 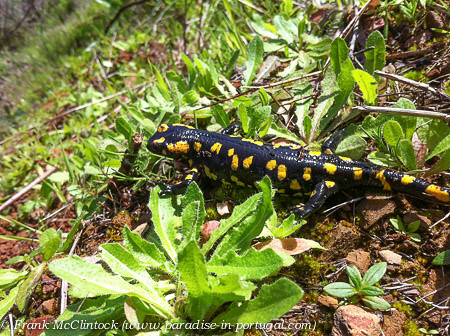 Fire Salamander-0366, originally uploaded by Paradise in Portugal. For a couple of weeks now we’ve had a spell of lovely wet weather, which, though mud-inducing in the short term gives the promise of a beautiful Spring on the way. Daniela and I have been making the most of the damp soil and clearing the footpath up Lavender Hill on the way to Cortes Pereiras so that our walkers will have an easier go of it later on. It hasn’t been cleared for donkey’s years as fewer and fewer people need to use it, so it’s been quite a job and our hands are cut to ribbons, but we came across the Fire Salamander above this morning which was a nice surprise. They’re territorial but quite harmless and display their inedibility clearly, so the dogs kept well clear of it! For those who are interested in the environment there’s an update on the Salgados situation on my Birding Blog. Basically there’s going to be a public presentation of Finalgarve’s “Environmental Park” at 11.00 on 4th February in Silves Biblioteca and I urge everyone who can to be there so that we can make ourselves heard. Southern Gatekeeper-5653, originally uploaded by Paradise in Portugal. The weather this Spring has been gorgeous, hot sunny days interspersed with a few rainy ones here and there. Wetter than normal and the rain seems to have lasted a great deal later than usual which has kept everything green and fresh. Loads of food around for all of nature to take advantage of and we’ve had great fun observing it all. One of the nicest places around the Quinta is the little Cortebrique Valley about three miles away, and I’ve spent many happy hours there during the past few months. 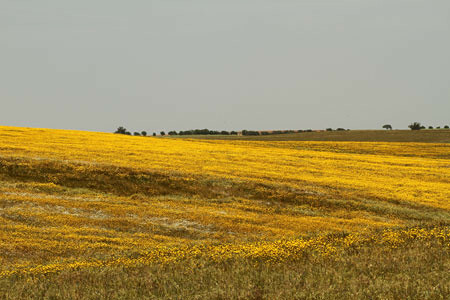 It has a mixture of habitats from scrub to grassy meadows to kitchen gardens and fields of maize and wheat to patches of cork oaks and woodland. I’ve posted quite a few pictures of birds I’ve seen there on the Quinta’s Birding website, and it’s sometimes difficult to know where that blog ends and this one begins – or vice versa – but this beautiful Southern Gatekeeper belongs here I think. There were quite a few of them yesterday in a small patch of wood, flitting about early on in the morning warming up; this is a male. He’s smaller than the female, (only about 15mm wide rather than 20mm), who lacks that beautiful pattern on the top forewing shown above. The pattern is actually scent glands called androconia that are used in attracting the female. They feed on grasses and like it hot with dappled shade, so the Cortebrique Valley suits them right down to the ground. They fly in one brood from June onwards throughout the summer, extending from Portugal eastwards to Turkey and along the north African shore, though apparently absent from the eastern Mediterranean. I got most of the above information, including the original id, from Matt Rowlings and his excellent website, so “Thanks, Matt!”. If you’re interested in butterflys I can heartily recommend a visit. Breakfast at the Quinta can be a lot of things; getting ready for the day, nursing an over-indulgence from the night before, lively conversation, a relaxed start or just a time to contemplate while enjoying the fresh croissants and the Quinta’s honey. In the background Uncle Harry is most likely welcoming everyone with “Olá” and squawking away like a wound-up toy while he clambers from one branch to another, and so it was this morning, but I found the Nightingale singing just outside the window too and grabbed this quick film which I hope you’ll enjoy! 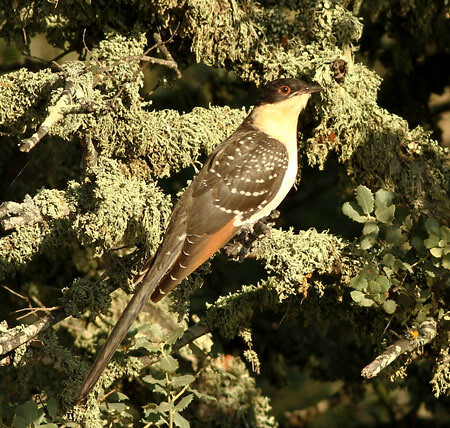 Juvenile-Great-Spotted-Cuckoo-2583, originally uploaded by Paradise in Portugal. In these days of economic crisis and general doom and gloom it’s easy at my wildly advanced age to become ever more Colonel Blimpish and whinge and moan constantly about how hard everything is, how nothing seems to work, how expensive Life is becoming, how, “it wasn’t like that when I was a kid” etc etc, and I do my fair share. Recently, for example, I’ve been beating my gong about the ridiculous bureaucracy we have to fight our way through here in general – and principally the outrageous price that Turismo de Portugal has seen fit to burden all of us Birding Guides with by making it obligatory to have a license if we’re to take anyone birdwatching. 950 euros plus extra insurance; totally obscene in my opinion. Y’see what i mean? There I go again; whinge whinge, moan moan, grumble grumble, and all the time my eyebrows become bushier, my nose redder, my hearing more selective and my blood pressure rises to dangerous levels, so it’s nice to balance this constant gripe with a tale of success, a tale to lighten your mood, a tale to bring a ray of sunshine into your life. To start with you must remember that the Quinta’s in the middle of nowhere, with the nearest town a good 45 minutes drive away; this has its advantages in that we live in gorgeous countryside with a view to die for and, apart from the bureaucracy, (careful Frank, keep your eye on the ball), very little stress, but it also has its disadvantages in that it’s a long way to go if an emergency takes one by surprise … like this morning when one of my teeth decided it didn’t want to be part of me anymore and took a hike. Saturday morning, oh blimey, now what do I do? Well, more in hope than anything else, I rang our “local” dentist, a great practice in Odemira running under the name of Juvenal Patriarca, (for you local bods, 283 322678, juvenalpatriarca@gmail.com), and was surprised when I was answered politely straight away. Explaining the situation I was told to come in, and an hour later was in the chair, with the job done within 45 minutes, at a very reasonable rate too, just 60 euros. Brilliant! What an antidote to an irascible Colonel! Long may their practice thrive and I take my hat off to ’em and thank them sincerely. 10 o’clock tooth goes awol; 11.45 new one in place at dentist 45 minutes away. Stunning, efficient, friendly, well-priced service; I’m not used to it here at all. Perhaps they could have a word with Turismo de Portugal? And what does that have to do with the picture of the Great Spotted Cuckoo above? Nothing at all, but I hope that the picture makes you feel as happy as I do today! Have a nice one! A huge thunderstorm broke over our heads in the middle of the night and I was up and down the stairs protecting our electricity – most of the time splashing about with a tatty old umbrella and an equally tatty hat and dressing gown! I finally got back to sleep again in the wee hours, only to be woken by an excited Flora at half past six gabbling on excitedly about something or other, and my excitement matched hers as she told me about the Fire Salamander she’d just found outside. Rushing downstairs again we found him where she’d left him. They don’t wander far – nor too fast either, though this one was quicker than most as it was only young – and they’re territorial so it’s a real bonus to have them around here. They love this warm, wet weather and come out on nights like the one we’d just had, so it was a real silver lining to all that lost sleep. Contrary to the forecast it turned into a beautiful day as well AND we found a Death’s Head Hawkmoth. It was great to spend a day at home, the first in quite a while, and to take a little wander around the “home patch” too; we were even lucky enough to come across this Dartford Warbler who’s got a nest in some scrub in the garden; what bliss! Following his family’s successful Fishing Holiday in Portugal at the Quinta, Christophe sent me this lovely film he made while here fishing with Paulo Jorge Ramos, the World Wide-mouthed Bass Champion. I think they enjoyed themselves! So, notwithstanding the Quinta’s reputation as a birding and nature hotspot, it’s not all about those past-times, not by a long cast!! 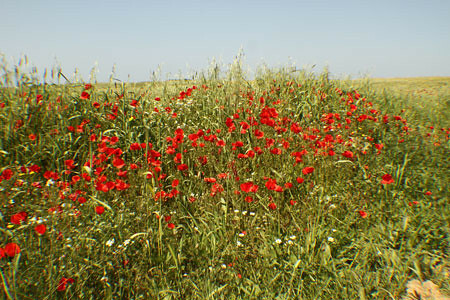 Poppies-0475, originally uploaded by Paradise in Portugal. Another quick roadside shot of some of the beautiful, beautiful flowers at this time of year. This time they’re just common poppies – but in such profusion as to take your breath away, and, mixed in as they are with the crops in the fields, they turn every view into an impressionist painting. Sunrise-0573, originally uploaded by Paradise in Portugal. I spend, as a lot of you will know, an inordinate amount of my time showing our guests the birdlife that surrounds the Quinta, and many many mornings I’m up before dawn to be in the right place at the right time. The early bird, as they say, catches the worm, but if you want to catch the bird then there’s no option than to be up even earlier. I know some people have trouble getting up early, especially on holiday, but there are some wonderful compensations, and none better in my opinion than to see the sun “come up like thunder” across the Plains of the Alentejo. Flower-meadow-0107, originally uploaded by Paradise in Portugal. Another small taste of what the countryside is like around here at this time of year. A real joy to be lucky enough to have a “job” that gives me so much time and opportunity to see the stunning flowers that surround the Quinta right now. The birds are simply fantastic too; all the latest postings can be seen on the Quinta’s Birdwatching site.